Hi, I am Eric Harness, one of the instructors of Star Circle Academy. I want to first thank Steven for the great intro, also for his inspiration and his mentorship. Steven asked me to add some important details to his Panorama Pursuit article. So here I will expand on the information that Steven described by adding important panorama setup considerations, shooting tips and my work flow. Panorama’s give the viewer context and detail that is not possible with standard photo sizes. So use this to your advantage to show the viewer interesting elements to heighten the scene. A scene worthy of shooting is worth the effort to set up the shot properly. Seek wide open spaces where the relationship between elements gives an emotional connection to the place or thing. A lot of landscape photographers like to exclude human elements in landscapes. However, including people, cars, and other human sized things helps to pull your viewer into the scene. Park your car on the rock, leave the door open, have your friends pose looking into the scene. Just make sure you connect the people in the scene to the rest of the scene. Highlight their interest or the viewer will not be interested at all. People stop to look at what others are looking at all the time. Let me give you a great example. I often visit a large national park and I will often stop to photograph the animals on the side of the road. I stop and ask my passenger to point out the window. Or for even more effect I have my passenger a poke big lens out the window even when there is nothing there! People behind us stop and look while I slowly creep away. This happens all the time – not just in the park but also at the mall, or art gallery, or along the road. I use this natural human curiosity to look at what others are looking at to my advantage and put these on-lookers in my panorama! It may seem like an after thought but once you bump your tripod in the middle of a panorama shoot you will be reminded about the importance of your base. All of the elements depend on having a solid base so spend careful time to set it up. Extend the legs in a manner that allows the head to be as level as possible. Spread the legs so that the weight of the head and camera is over the center of gravity of tripod. Even if you are not using a pano head the extra effort will help preserve the edges of your image (trust me it looks like your camera is on a roller coaster when it is not done correctly). This multi-row panorama was not leveled before the intial shooting. The fix at this stage is to crop or fill but in this instance would make the image un-usable. Any wiggle in the base will cause tiny misalignments in your images which can cause blurry stitches or fuzzy images (especially for HDR panoramas). Parallax errors occur when close and far objects shift in the frame relative to one another. This problem occurs when the camera is not rotated around the optical center of the lens. The shift between close and far objects in more noticeable than the shift between two objects that are far away. If you keep all elements – especially important subjects – far enough away you will be less likely to encounter parallax error. Like Steven, I am not about to jump into the fray over the terminology wars over “nodal point” or “No Parallax Point” discussion. However for an example of parallax error have a look at Figure 1 and Figure 2 below. Figure 1 shows proper alignment on the “no parallax point”, while Figure 2 shows how parallax results in an inconsistency. Figure 1: These two images resulted after rotation around the "No Parallax point". Note how the foreground bars align with the same background objects. If the lens rotation is NOT made around the “no parallax point”, then foreground and background objects shift as shown in Figure 2. 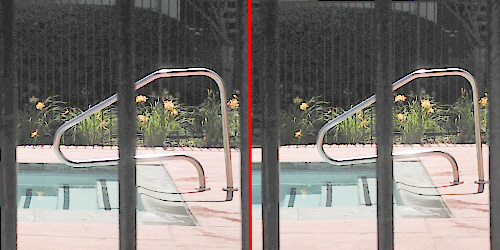 Figure 2: Two adjacent images with parallax - Note where the middle bars appear in relation to the steps behind them. Alain Hamblenne has written an excellent article about how to align a panorama head in the horizontal and vertical directions. Note that Mr. Hamblenne refers to the no parallax point as “the entrance pupil“. Even if you do not have a panorama head, the procedure Mr. Hamblenne describes will help to determine where the best center of rotation is. If you are lucky – as Steven was – you may find that your lens ring mount is almost the perfect place. Rotation around the tripod mount point in the camera is almost certainly not the best point. Focusing is not that hard in my opinion; just know your hyperfocal distance! Yes, learn it for your lenses at different F-stops. Get out the tape measure and start pixel peeping. Look up the resources on the web (DOFMaster) and learn to tell the distance by eye and turn off auto focus, then manually focus the lens. Ok, focus done! Furthermore, if you are doing this at night no worries you know if by heart if you don’t then turn on the million candle power flashlight (your cheater to activate your autofocus in the dark, then turn autofocus off). Let me first cover why I do HDR (High Dynamic Range) Panoramas. There are generally two reasons 1) the Sun, 2) your camera sensor. 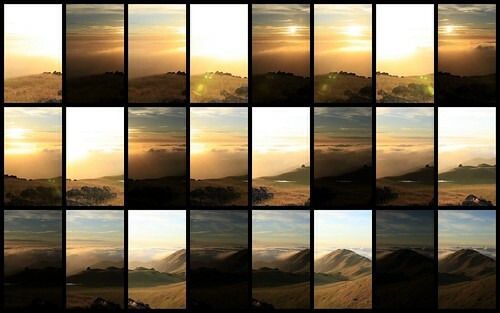 Most panoramas span a large tonal range because of the directional light from the sun thus one edge might have a different exposure value then the opposite edge. To make it even more difficult your camera’s sensor is not capable of capturing that level of tonal range in one photo. Thus we take multiple exposures (bracketing) to capture a wider tonal range to represent what was really there. Now that we have explained why bracketing for an HDR is important it is critical to determine the proper exposure range. Since the scene may span the tonal range from a dark canyon to a bright sunny area getting the proper exposure range is important. There is no camera capable of capturing such a wide range of tones in a single photo. But how do you decide the exposure range of the bracket and where the middle exposure is? This is the method I recommend: Set the camera to Aperture priority mode and set the metering mode to a single meter point. Then swivel the camera to some of the brightest and darkest areas in the range of your panorama. Then average the highest and lowest limits to select the middle of the range and then select bracketing that will encompass the approximately the whole range. Remember to switch back to Manual mode and set the exposure to the middle of the range and select your bracket. Typically as Steven suggests a two exposure bracket on either side of your middle will give you enough exposure range for most HDR panoramas. I will typically set my bracket at a full stop and take a range of five exposures for my HDR. Here is an example of calculating the proper exposure. Assume the darkest area of your panorama meters at 1/30 of a second at f/9. And the brightest area meters at 1/300 of a second. 30+300 = 330 and half of that is 165, so the middle of the exposure is about 1/160th – or whatever is closest. That’s not too wide a range. From 1/160th plus and minus two stops covers both 1/30 and 1/300th. Now your camera is set up for taking the photos but where should you start? Some people use the degree scales on the tripod head to determine the overlap but I don’t recommend this. Why?…well by not seeing what is in the photo you can’t determine if there is enough detail for the software you will later use to detect the overlapping elements in the photo. Areas with large expanses of water or sky have little detail and will be hard to stitch. The overlap I recommend is 30% to 50% but I have been forced to use 10% in areas of sky between trees. I have to first decide where to start and end, what direction do I go. I look at what I want on the edges of my panorama the I pick something further out then that to start and stop at. If I want to include the top of a peak then I will make sure to include some buffer in case I need to do some cropping. Therefore, I will pick a solid landmark like a distinctive tree I call these left and right anchor. This element usually will run vertical through the frame so I will run into it if I do a multi-row panorama. I will center this object then I will I always start from the first frame at the left and go right just for consistency. If I am doing a multi-row panorama I usually place the horizon on the lower third of the image to maximize the amount of sky I can get but I always start from the bottom left then march to the right till the anchor is well within my frame the I tilt the camera up to capture the next row proceeding right to left till I reach my anchor then move the camera up again and proceed left to right again. The first photo usually take in a set is a simple shot of my hand to indicate that this is the beginning of a new pano. I cannot tell you how many times this has come in handy in determining quickly where the shots from one pano end and the next begin. Also it help me to quickly group the photos so I do go through my photos say “that’s a crappy photo—delete” then only to realize it was the middle of a panorama (I have done that). How do I take the photos so I don’t miss a photo in the bracket and keep my photos aligned? I use continuous release mode and remote release to lock the shutter to shoot all the images in the bracket before I look in the view finder to align the next set in the panorama. This allows me to pay attention to the things around me like people moving into the shot or time the shots to avoid the wind instead of counting shots. As Steven suggested use your favorite HDR program and stitching engine to combine the images. I recommend using PTgui because of the enormous amount of control and power. But there are other stitching engines out there: Autopano, Microsoft ICE, Photoshop, HUGin and the list goes on. I use PTgui because I can HDR and stitch all at once. PTgui can run in batch modes to automatically identify which images belong in a single pano and start the stitching. In the newest version of PTgui you can zoom in on the preview panorama, mask out the “unwanted tourist” and preview your stitch lines. The software also allows you to output the images in the set as a photoshop “.pdb” file in layers or the entire blend and stitched panorama. Thus you can fix certain elements of the photo like shaking branches or moving people. All of the dedicated stitching engines PTgui, Autopano, and Hugin allow you to take full control and stitch low contrast photos by adding control points to the elements that match in your overlapping areas telling the software these areas are the same. Control points help the software to match corresponding points despite any distortion caused by the lens. Manual alignment is not possible in Photoshop CS5 or Microsoft ICE. 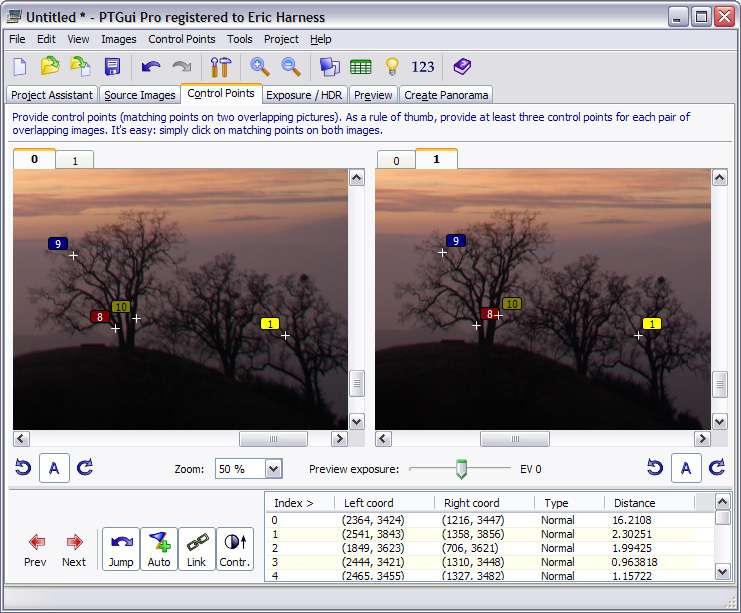 PTgui control points are a huge advantage in aligning stubborn images with little detail. Find some details that overlap and are easily recognizable in the two photos zoom in and click on the pixels that represent the same object in each photo. I like to use distinctive branches, tips of trees or jagged mountain tops; something that has a sharp edge and will be easy to match the pixels in the other photo. Once a few manual control points are added the software takes over and starts aligning the matching points automatically. With a sufficient number of control points the software can use the information to warp and stitch the images into the final panorama. If you don’t have an engine that can handle both HDR mapping and stitching at the same time no worries you just have a few more steps. First do HDR blending using the images of your main subject, meaning the people or the thing you are using to draw your viewer into the photo. Save the HDR settings for the main subject and process the rest of the bracketed images using the saved settings. Doing HDR blending first and then stitching is much less error prone than stitching first and then blending. Once the blending is to your liking drag the blended images into the stitching engine and let the software do the rest of the work. What About Stitching Night Images? If night images are what you want to stitch, please stay tuned as the next article will cover panoramas in your night photography. Finally let me point you to fantastic resource for more on panoramic imaging. Panoguide – a forum for panoramic imaging. Panoguide is a in-depth discussion of the hows and whys of panoramic photography. They have an expansive “How to section”. This entry was posted in Creativity, High Dynamic Range (HDR), Image, Image Stitching, Photo Processing, Photo Tip, Photoshop and tagged Autopano, calculating exposure, control points, HDR, high dynamic range, hugin, Microsoft ICE, panoramas, Photomatix, Photoshop, PTGui, stitching on June 29, 2011 by Eric Harness. First and foremost I’d like to thank my friend, Eric (Mr. Panorama) Harness for teaching me the basics of this panorama stuff. He’s even helped me salvage a few of my early bad attempts. Eric knows what he’s doing. I’m a dabbler. 15 minutes before sunset clouds and fog over the San Francisco Bay amps up the goldenness of the golden hour. All 24 shots (see below) were taken over a 1 minute and 20 second time span. This view spans NW to North. What fascinates me about this technique is how well the sun can be included in a normal daylight shot, and how using panoramic techniques is a great way to avoid or eliminate flare. I’m not new to flare. I’ve developed a few techniques to control it. But this method was a pleasant surprise. There are two important things to get right to pull this off – at least to do so well. Get the right bracketing of the exposure. Level that tripod and camera. Set autoexposure bracketing (I recommend 0,-2,+2 on Canon, or 5 stops on Nikon). Let me try to explain a little. A sturdy tripod is a must for a stress free panorama and doubly so if you try to use HDR. I don’t have a panorama head, but I discovered that using the tripod collar on my 70-200mm f/4 L lens is a great advantage. Since things near the camera are more likely to cause stitching errors avoiding elements closer than the hyperfocal distance is a good strategem. Hyperfocal distance is a big word and a slightly murky concept, but I’ve covered it before. There are holy wars about what the proper name is for the correct pivot point to take images for a panorama (horizontal images) or vertorama (vertical images). I really don’t care what the point is called, but knowing that it is definitely somewhere IN the barrel of the lens is important since the tripod mounting location on the camera itself is definitely NOT in the correct place. The best camera orientation for taking a panorama is portrait (vertical) mode. Short of investing in a nodal rail and a bunch of other panorama specific hardware it becomes obvious that a ring collar around the barrel of the lens is the simplest “good enough” solution – even if it is not the perfect place. To find the proper rotation point is pretty straight forward. Have something in the foreground and something far away. Place your camera and the left edge of your frame such that the foreground and background item nearly overlap. Then swing the camera around the attachment point to confirm if at the right edge of the frame the objects have the same spatial relationship. A more detailed explanation can be found here. For zoom lenses the proper pivot point may be different at different focal lengths. I merely pass along this observation: using the ring collar at 75 mm on my 70-200mm f/4 L lens I get no stitching errors. That is good enough for me. I mentioned leveling the tripod. That is important or the panorama will be skewed and detail is lost when I have to crop off a lot of the image – and realism will suffer, too because the horizon will also go weird. I recommend setting the horizon in the middle of the frame and rotating the camera well past your beginning and ending points and making sure the horizon is level in all the shots. I mess with the tripod and the ball head until it looks good to my eyeball. I do not use a level or bubble level for this, though I am sure one might help. While looking at the various frames that will comprise my panorama, I note what the camera metering says. When close to, but not including bright light sources the metering will define the fastest exposure needed. The slowest exposure is defined by the darkest areas. If 5 stops is not enough, the image may not work. At minimum I want my fastest exposures to be right for the brightest areas (usually the sky) and my slowest exposures to be right for the darkest areas. I choose the exposure that is midway between the extremes as the starting point. In this case, I saw that at ISO 200, f/8 the bright frames metered at 1/1250th while the dark frames metered at 1/80 so I set the exposure to 1/320. Two stops slower is 1/320 × 4 = 1/80. Two stops faster is 1/320 ÷ 4 = 1/1250th. I took test shots to confirm that at least one of each of the shots in each set was not seriously blowing out pixels. Shooting starts by setting auto exposure bracketing on, aiming the camera to the left of my intended first target and firing off the bracketed sequence. I then rotate the camera to overlap the last shot by about 1/2 to 1/3 and keep shooting until I have gotten at least one full frame past my intended ending point. For speed, I also have been producing RAW and small JPG files. Usually I process the small JPGs first. If I later want a larger image, I can start over with the RAW files. I use Photomatix Pro in batch mode to process each image set into an HDR image. I found “all defaults” worked pretty well in most cases, but it is possible to tweak things a little if I desire. Photoshop’s merge to HDR can be used but it seems to be much slower, and I do not know how to automate the batches. I also find the Photoshop interface to be a bit clunkier. Once each of the HDR images has been created the HDR images can be loaded into Photoshop and stitched using the “photomerge” operation. When I used the Photoshop photomerge operation it left some serious flare in the image which I had to manually fix up by adjusting the layer masks. By contrast Microsoft ICE – a free tool – removed the flare automatically by using the non-flared overlapping portion of another image. I finished the image in Picasa by adjusting the white balance (cooler), adding tags, downsizing and adding watermarks. The same evening I made the featured image, I also created this image. I much like it, too. Thanks for reading. Comments are welcome. Sharing with your friends is encouraged. And if you are further interested, please join me at one of our Workshops where you can learn this topic and many others. Oh, and keep an eye out for Improving your Panoramas written by Eric Harness, yes, THE Eric Harness who taught me the technique in the first place. This entry was posted in Image Stitching, Photo Processing, Photo Tip, Photoshop and tagged HDR, high dynamic range, Image Composite Editor, Microsoft ICE, Mission Peak, panorama, Photomatix, Photomerge, Photoshop, San Francisco Bay Area, stitching on May 25, 2011 by Steven Christenson.